Cook a 16 oz pkg. 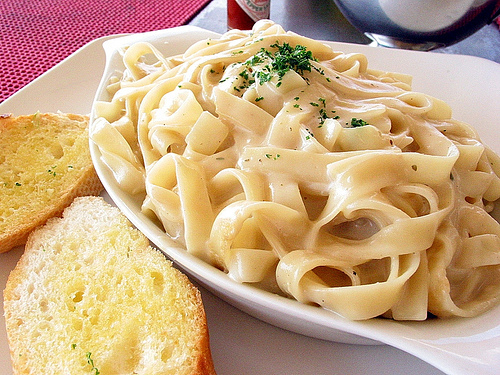 of fettuccine pasta as the package directs. Drain pasta & return to the pan. Add 2/3 cup of butter to the pasta & mix well. Add 3/4 cup of half-and-half to the pasta & mix well. Add 3/4 cup of shredded Parmesan cheese & 3/4 cup more of half-and-half, season & mix well. Add 3/4 cup of shredded Parmesan cheese again & mix well & serve. You can top each portion with more Parmesan cheese and seasoning.